Chinese Body Clock - What is the Chinese Meridian Clock? Don’t miss our easy-to-read TCM body clock chart with info on symptoms and healthy daily routines at the bottom! However, an unbalanced stomach meridian will not necessary manifest as abdominal pain. Instead, you may experience nausea, sore throat, nose bleeding, or gum toothache. 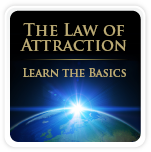 An unbalanced stomach meridian can also be manifested on the mental and emotional levels. 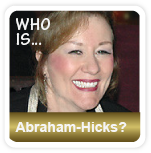 Problems of letting go of things, situations, places, or people, are often related to an unbalanced stomach meridian. This means that an unbalanced meridian can be manifested on all levels: physical, mental and emotional, according to the Chinese Body Clock. Furthermore, certain activities are best performed at certain times, according to the TCM Body Clock. As we follow our biological and natural rhythm, we will automatically help balancing our meridians. 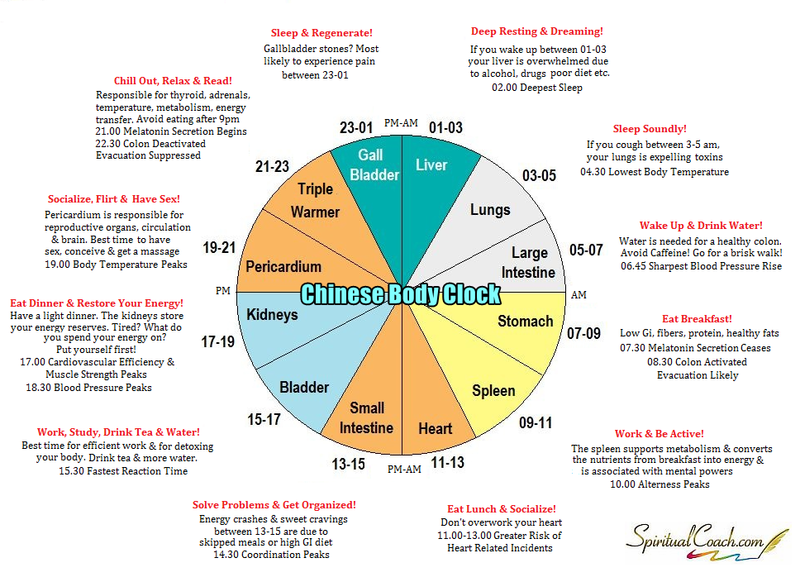 Use the Chinese Body Clock table below to identify what particular body organ / meridian that needs attention, and learn how to balance your body. 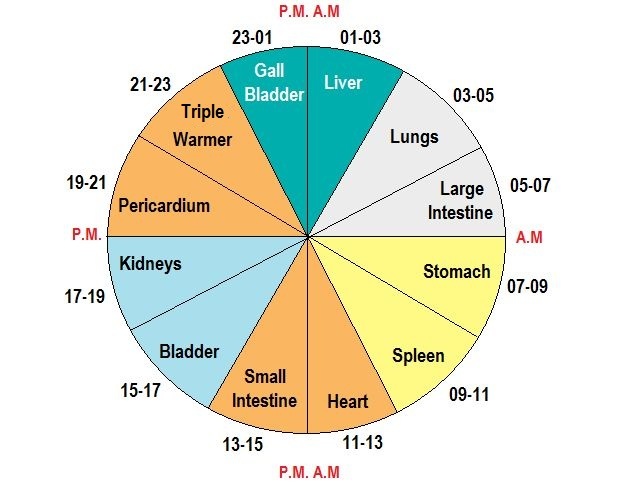 The Chinese Meridian Clock table shows the time period for each body organ / meridian, associated symptoms, and balancing activities. Physical level: heart problems, abnormal heartbeat, thirst, bitter taste in mouth, yellow skin/ eyes, red complexion, incoherent speechEmotional & mental level: frightfully sad, restlessness, lack of passion/ inspiration/ joy, uncontrollable crying/ laughter, mental confusion, poor memory/ concentration, bipolar disorder Eat Lunch & Socialize! The lunch should be balanced, nutritious, warm, filling, and not too big. According to the Chinese Meridian Clock, this is the time to enjoy conversations, connect with people, and to cooperate. Reach out to people, be of service, and find your passion. Studies show that most heart-related incidents occur during this time frame, so don’t overwork your heart between 11am-1pm.